I once heard Navigators missionary Jim Petersen say he read through the Bible continuously, using Matthew Henry’s reading plan—but only as a way of remembering where he left off. Sometimes he would read a lot, sometimes just a bit, depending on where he was (often waiting for a plane) and where his head was at. Sometimes he would go for awhile without reading, but not for long. What struck me, though, was that he didn’t do it as a discipline for its own sake, but as a means to finding answers. He always had one or more questions in mind as he read, and as a result would always find new things along the well-worn paths. I’ve never developed the habit of regular Bible reading. I’ve read the Bible plenty, but it has usually come in spurts, and for years now I’ve known the territory well enough that I often find myself looking up one or more relevant passages as I think through a problem. (I like Bible Gateway for this.) And as I review passages or read what comes before or after I stumble across new things, which I either pursue or file away for later thought. Although it doesn’t rise to the level of a full-fledged complaint, my quibble with the usual exhortations to “spend time in the Word” is that Scripture reading is presented as an end in itself, like relaxing or eating well or going for a walk. (Which is kind of funny, because these days exhortations to relax or eat well or go for a walk are usually cast as means to some other end!) And perhaps spending time in the Word has its own inherent benefits—but if so, I only experience them peripherally. I turn to the Bible because it can answer my questions, and can improve the quality of my questions as well. And I think that understanding the Bible in this way, as a resource to be used, leads one to approach Scripture differently, in many cases more profitably. As Stark notes, the rate of growth works out to a pretty consistent 43% each decade. Or, put another way, each disciple making one new disciple every twenty years. Now, I don’t know of any proposed program of evangelization that suggests we expect to work with someone for twenty years on average before they experience conversion. One of the more deliberate discipleship-based modern programs, Robert Coleman’s Master Plan of Evangelism, suggests that 6 months is enough to make a convert, plus six more to equip him sufficiently to be a convert-making disciple on his own. But this is totally out of sync with the most celebrated period of Christian expansion—at the Coleman rate, it would have been accomplished in less than 20 years. So something else seems to be going on. From 1776 to 1850 American Methodist grew like a weed. In 1776, Methodists accounted for 2.5 percent of religious adherents in the colonies, the second smallest of the major denominations of that time. By 1850, Methodists comprised 34.2 percent of religious adherents in the United States, which was 14 percent more than the next largest group. I was already intrigued by Wesley’s method of discipling believers in small groups—as well as the fact that, two hundred years later, this approach is hardly remembered, even by Methodists. 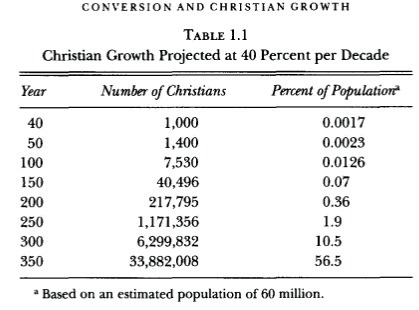 And now I have a pointer to another intriguing episode of explosive growth—and not just explosive but sustained, enough so to eventually capture one-third of a pretty religious population. Was it simply the Good News, presented Methodist style, which led to this? Or was it something about Wesley’s method?